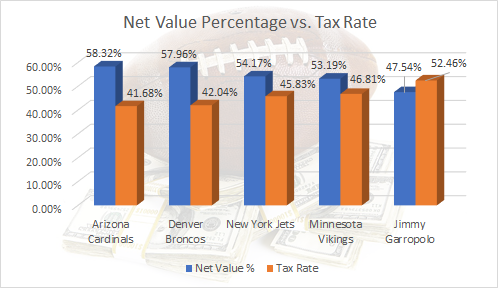 Regardless of where Kirk Cousins signs this off season, it provides an example, once again on how the ‘jock tax’ can affect the net (take home) value of a contract. With Kirk Cousins set to become the first high profile quarterback to test the free agent market since Peyton Manning in 2012, his sights are likely set on Jimmy Garropolo’s $137.5 million contract. Should Cousins negotiate a similar structure to that of Garropolo’s contract, Cousins, simply due to the tax rate on where he will play next season, should surpass Garropolo’s net value. There appeara to be four serious suitors for Cousin’s services. Those teams are the Arizona Cardinals, Denver Broncos, Minnesota Vikings, and New York Jets. Below is a table showing the home state and the resident tax rate for the four teams. Garropolo will likely establish residency in California, where he will be taxed at the highest state tax rate of 13.3%. As the table shows, the four suitors all play in states with a lower tax rate than that of California. All athletes incur federal tax liability on their total earnings. Their exposure to state and local taxes will be directly correlated to their team’s home and away schedule. Professional athletes must pay state taxes on the portion of salary earned in every state they play, often referred to as ‘Jock Taxes,’ in addition to the taxes they will owe in their state of residency. Residents are then allowed to take taxes paid to other states as a credit in their state of residence, up to their residence state’s tax rate. Players are considered a resident of the state where they have spent the majority of their time in the year and have economic ties. The table below outlines both the net value and total taxes for Kirk Cousins based on where he signs. It should be noted that it is assumed that Cousins was considered a resident of the state where the team is located. For comparison, Garropolo, as a California resident, has been included as well. The table shows that Cousins would be paying a significant price to play for the Minnesota Vikings who will likely afford him the best opportunity to compete for a Super Bowl immediately. Some observers believe that if Cousins were to join the Broncos that they too would be contenders. If Cousins feels the same way, Denver likely provides Cousins with the best-case scenario, with a high net income and potential Super Bowl aspirations. It is important for teams and agents to understand the potential tax consequences that professional athletes face. By quantifying the advantage or disadvantage as shown in the Cousins example above, a team or agent can systematically adjust their contract proposal depending on the teams in competition for the player’s services. While the total salary of a contract is easily obtainable, determining the true value takes considerable analysis. In order to determine the true value, the tax liability and the time value of money must also be taken into consideration. 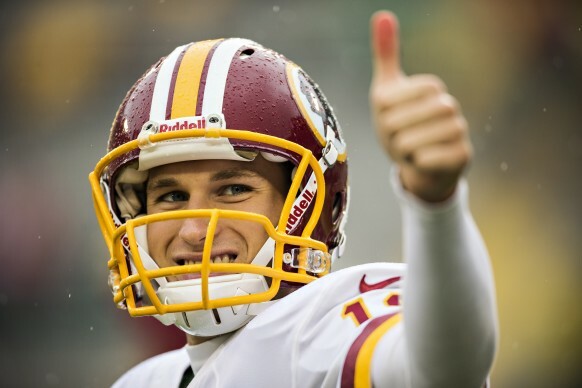 With this offseason, including not only the recent signing of Jimmy Garropolo and Blake Bortles, but also including the future signing of Kirk Cousins, Case Keenum, Sam Bradford along with Aaron Rodgers and Matt Ryan potentially signing extensions, this year will provide an interesting case study in comparing the true value of the NFL’s starting quarterback market.